As founder and Chief Creative Officer of a behaviour change agency, I am no stranger to the challenges of designing systems, processes and programs that make change happen. In my travels these last few weeks – including giving the opening address at AHISA, working with the leadership growth network at AITSL, rolling out transformation programs in schools, and delivering a leadership-focused breakfast seminar for leading corporations around Australia – a clear theme has emerged around the importance of using feedback in making change happen. To that end, I thought it might be useful to share some insights with senior leaders trying to catalyse change in their schools – be they changes around teacher quality, professional learning, strategic planning or other areas of importance in schools. There is universal acknowledgement that feedback is important. The ubiquitous John Hattie showed it to be the primary driver of student outcomes, the Harvard School of Education found that quality feedback for teachers can drive up to 30% performance improvement, and Ben Jensen of the Grattan Institute argues accurately that feedback must be a key component of driving genuine change in teaching practice. But I would go further than simply saying it is ‘important’. I would argue that if we are serious about making real change, we have to get equally serious about feedback. 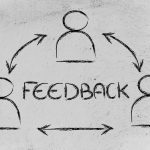 In fact, I would suggest that change is made exponentially more difficult (perhaps even prohibitively difficult) in the absence of a culture of robust and meaningful feedback, at all levels. Nonetheless, genuinely robust systems for 360o feedback are frustratingly rare in education, and there is still a real theory-practice gap. Below, I highlight four reasons why feedback (with particular emphasis on 360o feedback for teachers about their teaching) must underpin the transformation strategies of school leaders. Any leader who has gone through a 360o feedback process can tell you how confronting it is the first time you do it. What almost always surfaces is a disjuncture between how people see themselves, and how others see them. I call the gap between how we see ourselves and how others see us ‘the perception gap’. Interestingly, rolling out Educator Impact (a 360o feedback tool that helps teachers improve their practice) in a number of schools, I can confirm that the pattern holds for classroom teachers, too. Across a sample space of many hundreds of teachers and nearly 10,000 students, teacher self-assessment of their pedagogical and instructional effectiveness is almost always fundamentally different from the assessment of those who watch them teach, and most critically it is generally wildly different from the perception of students in 2 © Educator Impact. 2014. www.educatorimpact.com their classes. Sometimes self-assessment is harsher, sometimes more positive, but almost never identical to 3rd party perception. The sage transformation guru, Dr. Peter Fuda, artfully argues that this gap comes because we tend judge ourselves by our intent, not by our actual impact (even though, ironically, we normally judge others by their impact, not their intent). Feedback is our only real mechanism for overcoming this perception gap, and without it we are slaves to our own inaccurate, biased perception. Without feedback, therefore, most change agendas can’t even get agreement on a need for change, let alone actually make change happen. One of the unintended consequences we’ve found of comprehensive 360o feedback in schools, is that previously unknown ‘champions’ emerge. That is, we find that through a process of feedback, individual’s’ strengths that were previously unknown by the organisation – indeed, sometimes even unknown to an individual themselves! – get brought to the surface. We worked with one school where a feedback system for teachers identified both a substantial aggregate weaknesses across their teaching team in creating strong student relationships and also highlighted a number of individual teachers who were universally acknowledged as amazing at this very thing. That is – the process diagnosed the school-wide issue, and identified the internal champions who could help others improve in this area. So feedback doesn’t just diagnose what needs to change, a robust process can also help identify who can help us fix the problems, and how we might go about it. When it comes to making the case for change, nothing helps a leader like evidence. I remember sitting earlier this year in a debrief with a principal and their leadership team whose teachers had just participated in a round of 360o feedback (from peers, students and school executive). When we looked at the patterns in strengths and weaknesses, the principal commented: “well, I pretty much just won a bet! I knew those would be our strengths and weaknesses”. As the school HR Director pointed out while still sitting around the table: “yes… and now we finally have evidence to help people understand why we need to change some things”. That is, the feedback system took the change agenda away from being something they were doing ‘because the principal thought it was a good idea’, and turned it into something they were doing ‘because the evidence shows it’s something we need to do’. This helped them lessen the resistance of the detractors within the school, and make the case for change. Finally, we know collaboration drives performance improvement, innovation and engagement. We’ve seen evidence of this across all industries – the IBM Global CIO Survey, 3 © Educator Impact. 2014. www.educatorimpact.com for instance, showed that 80% of innovation in organisations was linked to spontaneous and unstructured collaboration between staff, while only 20% was linked to deliberate R&D. If we want to remove the ‘private practice’ perception from education (that teachers teach behind closed doors, and don’t collaborate), then the best possible way of doing that is by getting teachers comfortable with giving and receiving feedback. Making this feedback formative (rather than summative), and about development, not performance management, is the important first step. As always, though, the real challenge is actually making it happen. If we want to move beyond talking about feedback to really implementing it to help us drive change and transformation, we need simple systems and easy processes that are designed using best practice principles in behaviour change. Speak to one of our representatives to learn more on how Educator Impact can support your school.